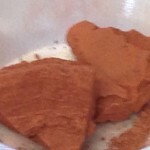 Pottery is made from native red clay. 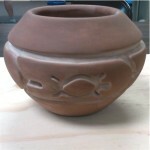 For traditional pottery the clay is dug from the ground and the processed by the artist. Temper is added to give it strength. 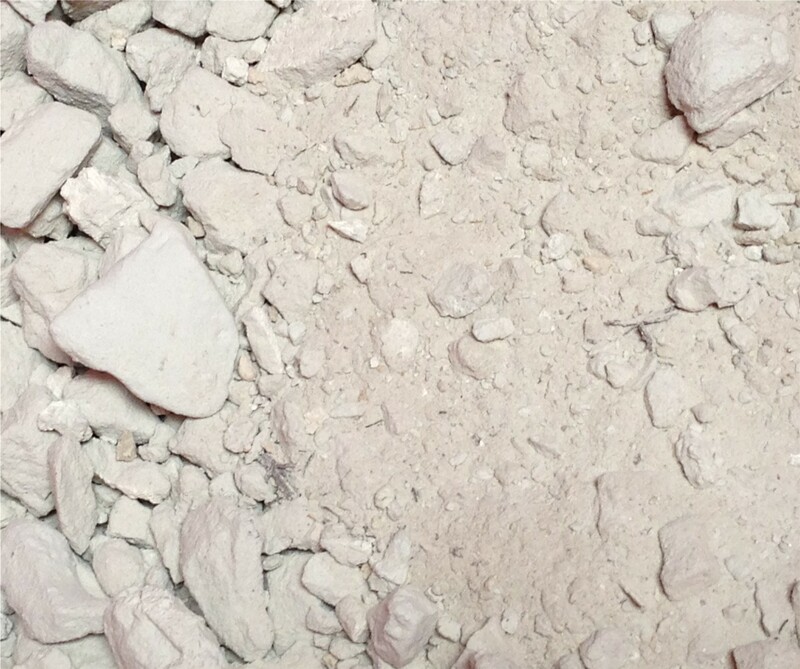 Once the clay is mixed it is ready to make a piece of pottery. Nathan Youngblood coil building a storage jar Nathan Youngblood smoothing the outside and inside of a large jar. 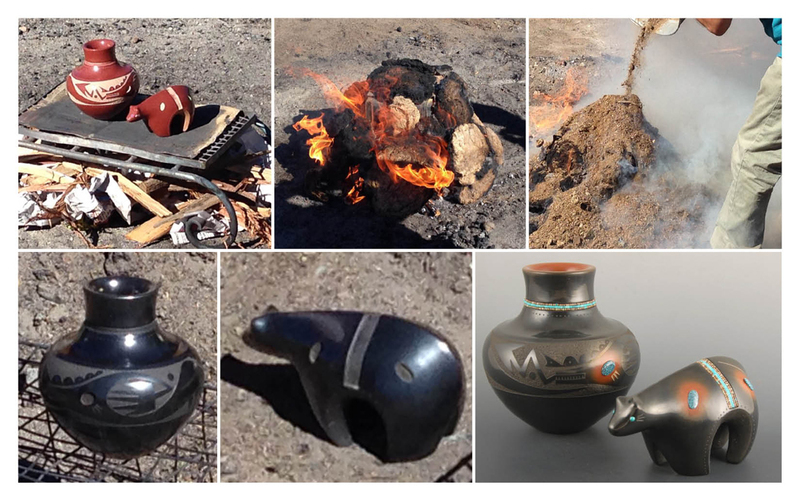 All Pueblo pottery and most Tribal pottery is COIL built, not thrown on a wheel! 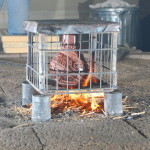 The clay is rolled out into coils and built one coil on top of another until the vessel is finished. The larger the vessel, the more time it takes to build. 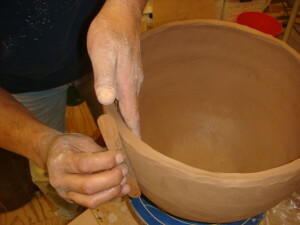 Once the jar is finished being built, it is sanded to make the surface smooth. It is then ready to be carved or painted. 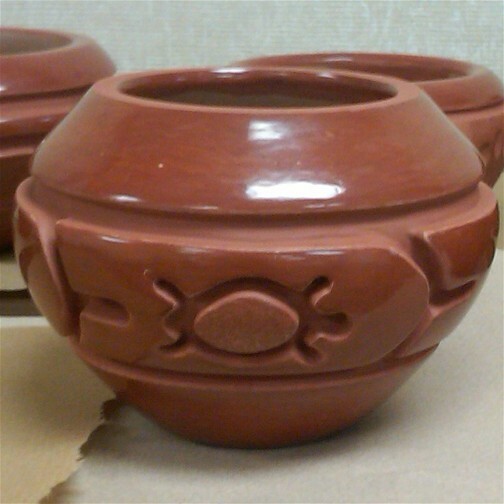 Pottery is painted or carved BEFORE firing. 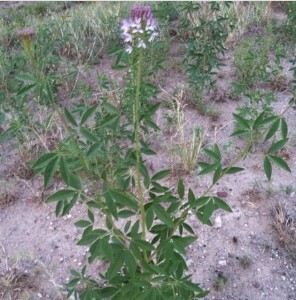 Kwaa Povi or Wild Spinach or Rocky Mountain Bee Weed. The leaves from this plant are picked when the flower starts to bloom. 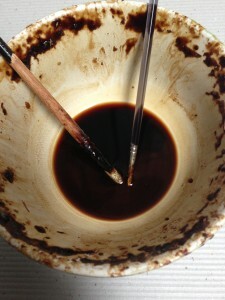 They are gathered and boiled to create the black paint used on the pottery. Wild Spinach Plant after it is boiled and left to harden. 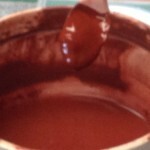 It is ground up and mixed with water to paint on the pottery. Wild Spinach Plant after it is liquified. 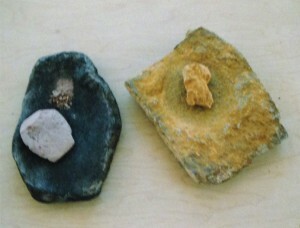 Hopi Rocky Mountain Beeweed plant and a metate for grinding the solidified essence into a watery paint. 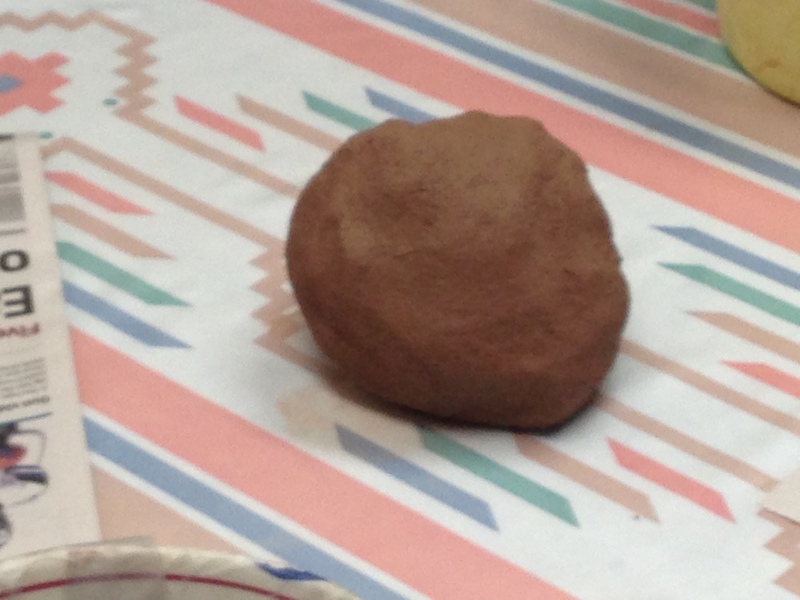 Clay slips in raw from before they are ground up and painted on the pottery. 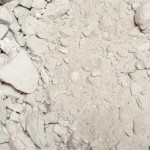 Before a piece can be painted, a slip, or wet coat of clay, is applied to the surface. 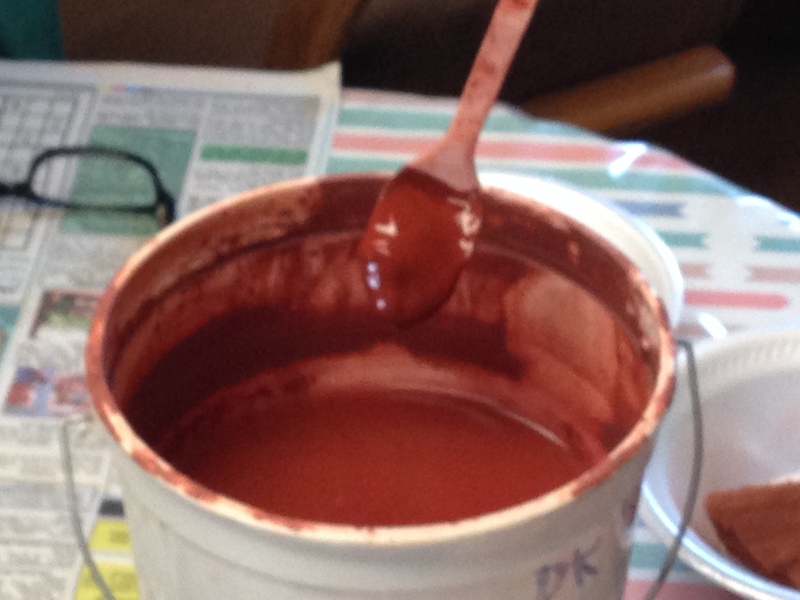 Often several coats are applied. 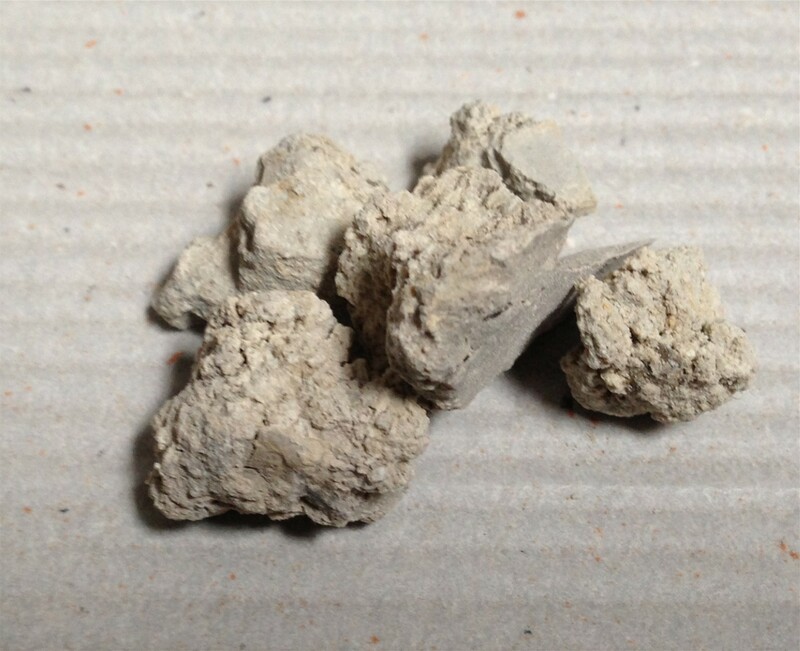 This creates a less porous surface to allow the paint to adhere during the firing. 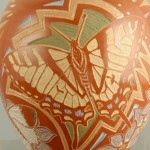 They also provide color for contrast with the painted designs. 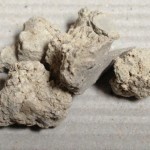 Slips are usually either a white clay (seen above before being crushed and turned into a slip) or a red cay (seen above both in its raw form and mixed with water). 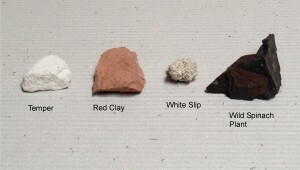 The white slip is typically applied with a rag while the red slip is stone polished onto the surface. 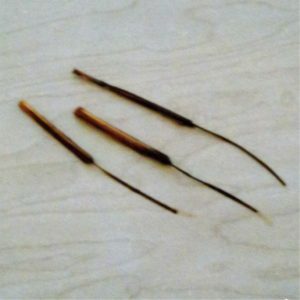 A piece can also be slipped with water, which is called a “wet polish” and again it provides a hardened surface for designing. 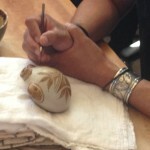 Virgil Ortiz painting with wild spinah plant on a canteen. 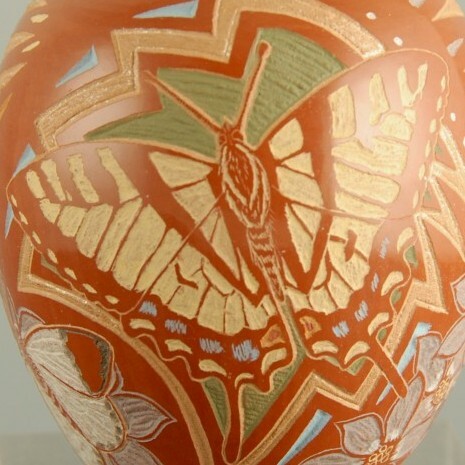 Designs are painted onto the surface with clay slips (red, other colors), or Wild Spinach Plant or Rocky Mountain Bee Weed (black color). 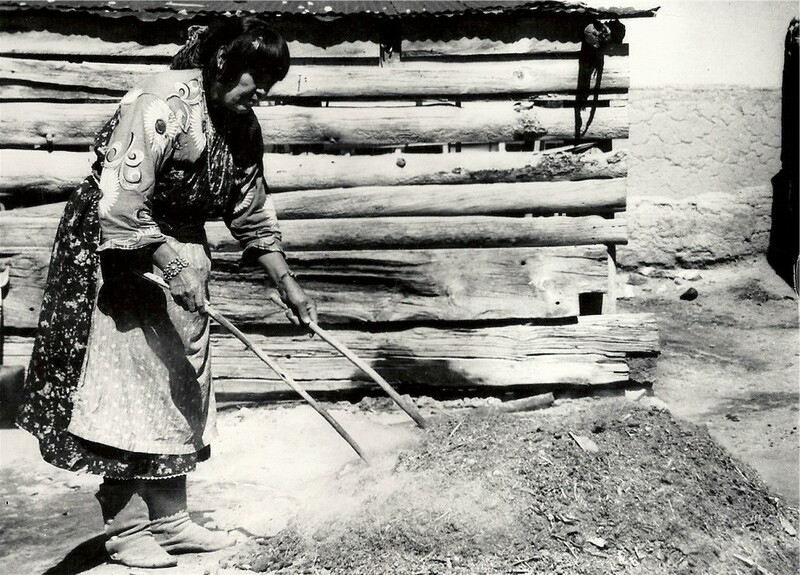 The wild spinach/bee weed is crushed and then mixed with water to paint onto the surface. 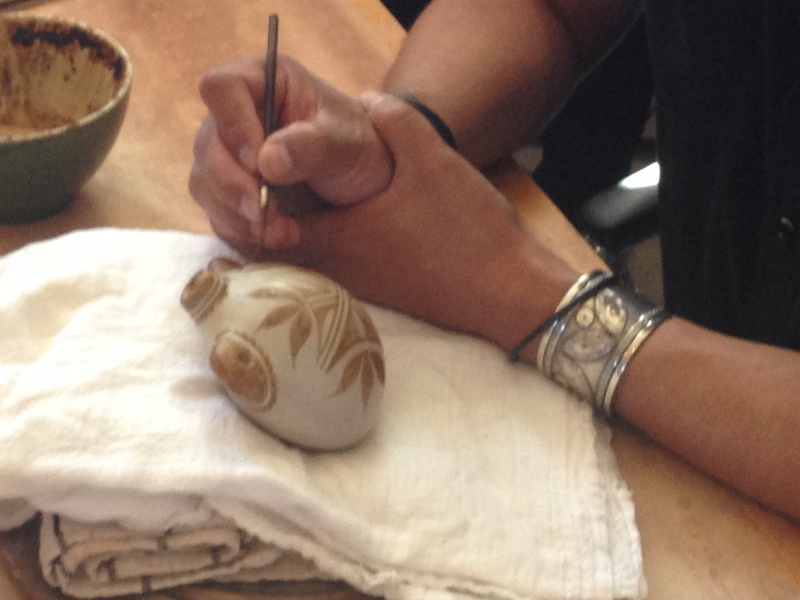 The potter uses either a paint brush with very few hairs or a brush made from yucca which has a single fiber to create fine lines. 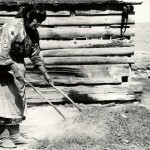 After it is fired the wild spinach/bee weed will turn black. Carved and sanded and ready to polish. After polishing! 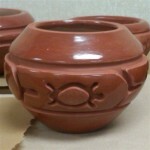 For carved pottery, it is carved BEFORE firing. 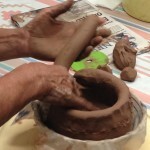 Potters may carve when the piece is either fully dry and hard or when it is leather hard (i.e. still a bit wet). The designs are often cut using tools such as screw drivers, nails or other sharpened instruments. Daryl Whitegeese Polishing the surface of a jar. 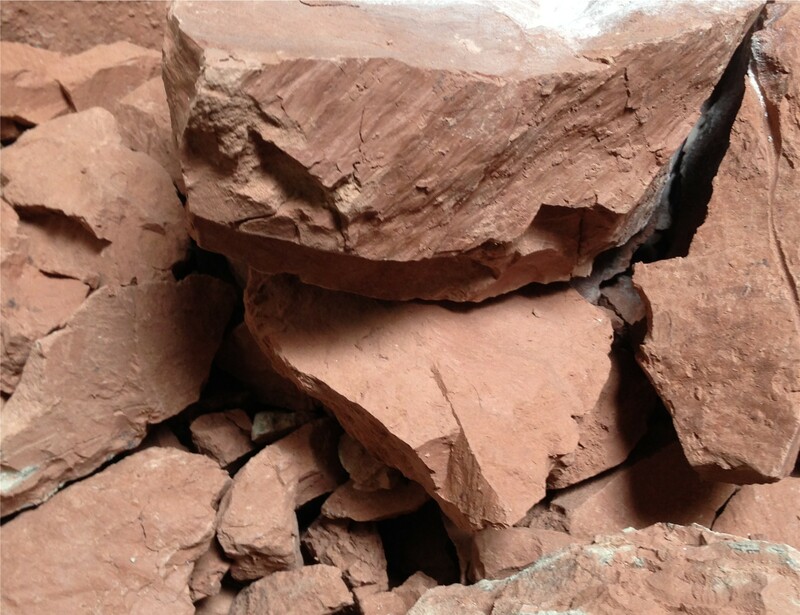 These are stones used for polishing the surface of the pottery. 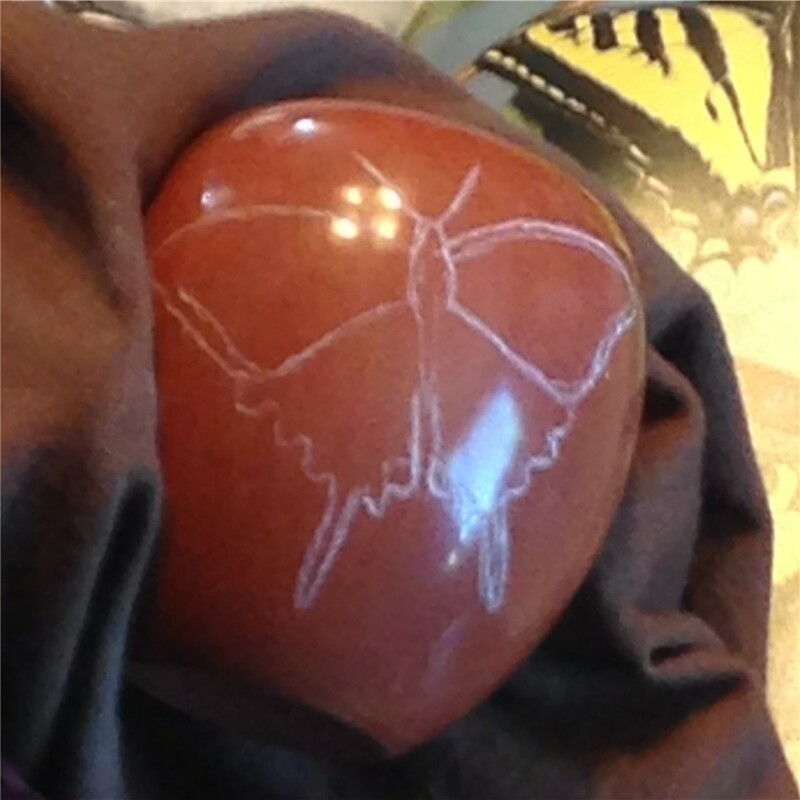 After a piece is carved it is stone polished or burnished. 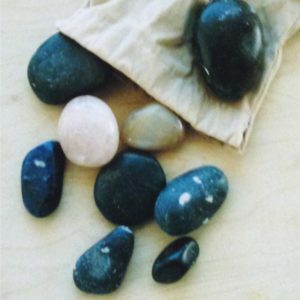 Above left are actual stone used for polishing pottery. 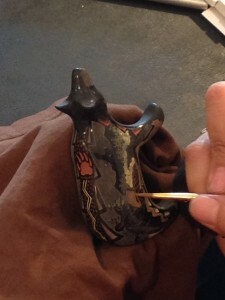 Each time a layer of slip is applied the entire area has to be polished again. 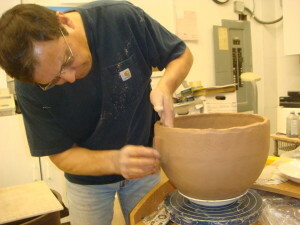 The potter may polish a piece three to five times. The longer and better an artist is able polish, the shiner the vessel will appear. Here you can see Daryl Whitegeese polishing the neck of a piece and note the stone in his fingers which he will use to polish! After a piece is fully polished the artist may etch designs into the surface of the clay. This can actually be done either before or after firing. 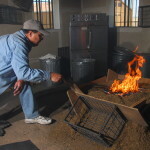 It is the ONLY technique that can be done after firing. A sharp tool such as an x-acto knife, nail or pen knife is used to cut away the polished surface. This is most often seen on smaller pieces, as it is very time consuming. 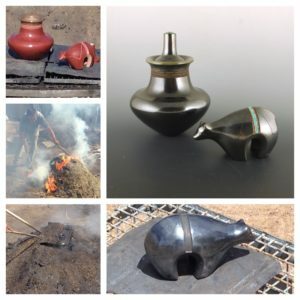 Above shows the process of etching into the surface and then how a piece by Jennifer Moquino appears as it is being designed and then after it is finished. 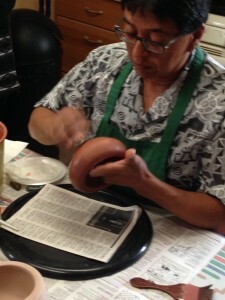 The above photos show the process of how Jennifer Moquino paints the clay slips into the etched areas of her pottery to give them additional coloration. 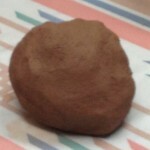 It takes time to find the various natural clay colors which will achieve the colors she wants to use on her pottery. Each Pueblo/Tribe and each artist has their own distinctive way of firing their pottery. 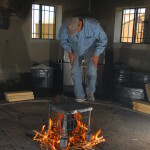 However, they all have something in common which is each piece of pottery is fired outside! 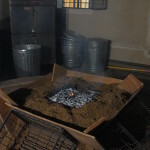 Wood and manure is used to heat the fire and it is a risky part of the process as everything is finished on a piece (i.e. 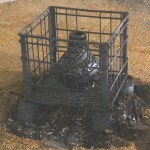 it is carved, polished or painted) when it is put into the fire. 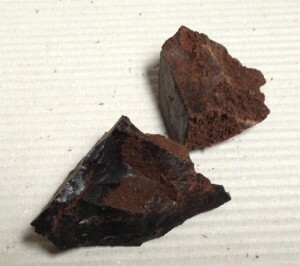 It is only after the firing is complete that the potter will know if it has been successful and the piece has survived or if it has cracked or broken in the process. 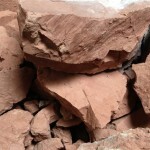 If it is damaged, weeks of work are lost and the potter breaks the piece to make sure that it never reaches the market. 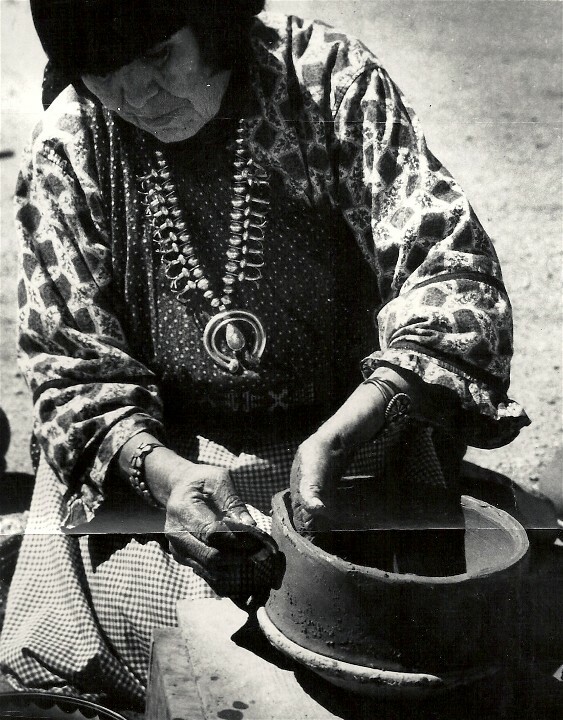 This is a classic photo of Maria firing her pottery. 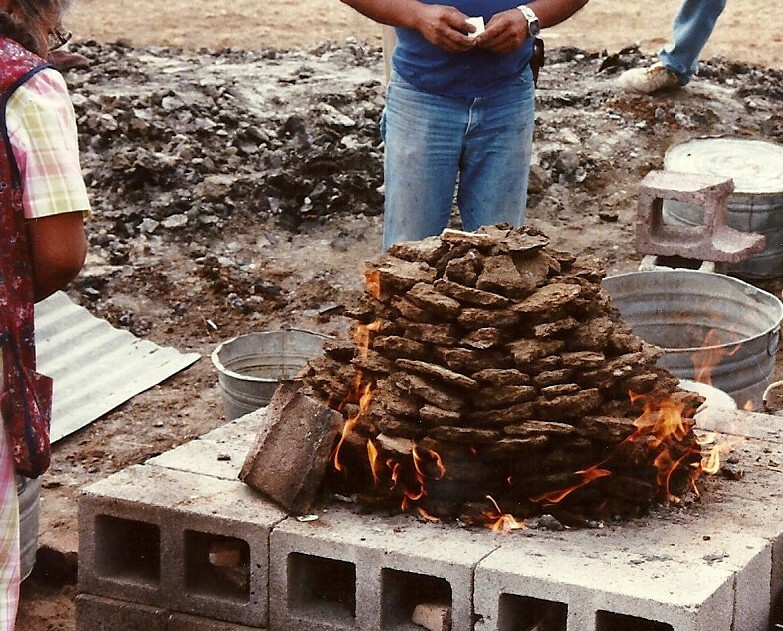 She would use the sticks to pull the pottery out of the fire! 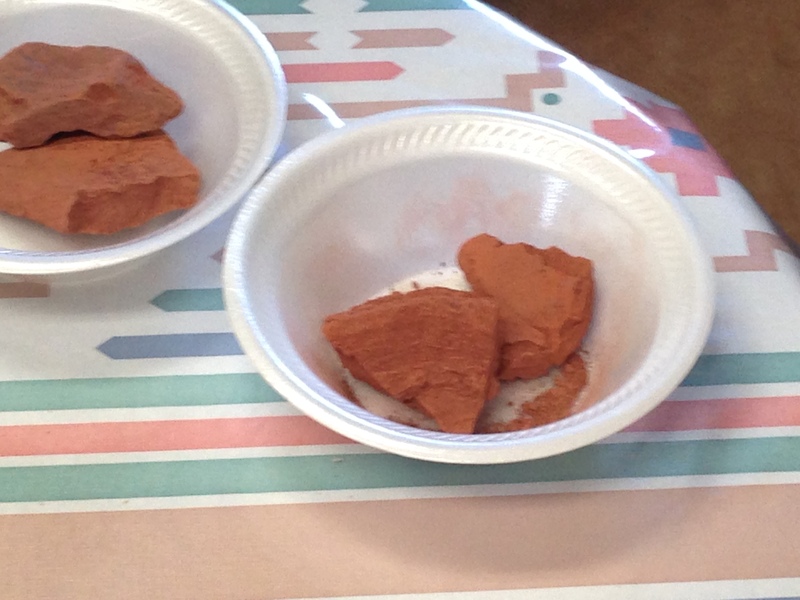 Here are two composite images which show how the pottery starts out red. 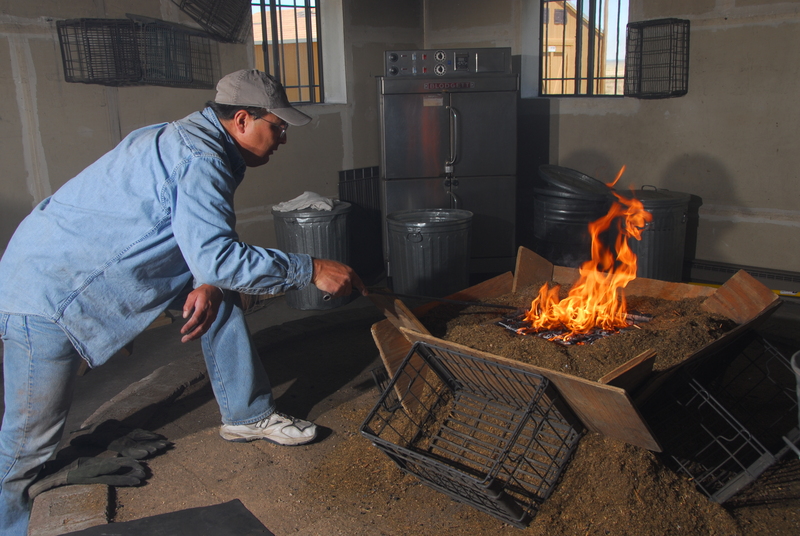 At the end of the firing the pottery is still red but horse manure is put on top of the fire and it is a reduction process which turns it black. Notice at in the bottom images that the red pieces in the top left are now black! 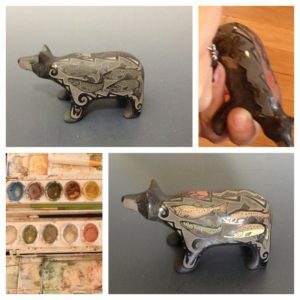 The pieces can then be “two toned” to make them black and sienna. 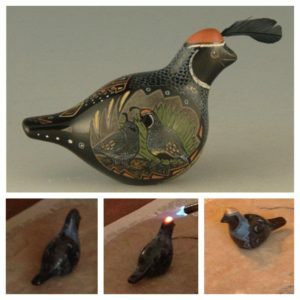 This is done after the firing. 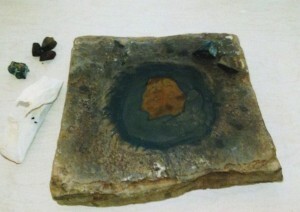 The additional stone and inlay are the last step after the firing. 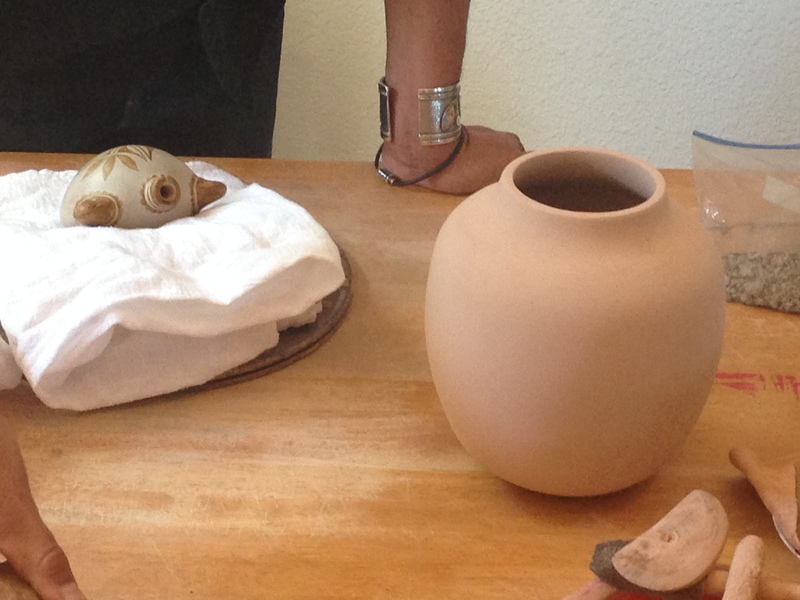 Jennifer & Mike Moquino “two-tone” their pottery to make sections “black and sienna”. 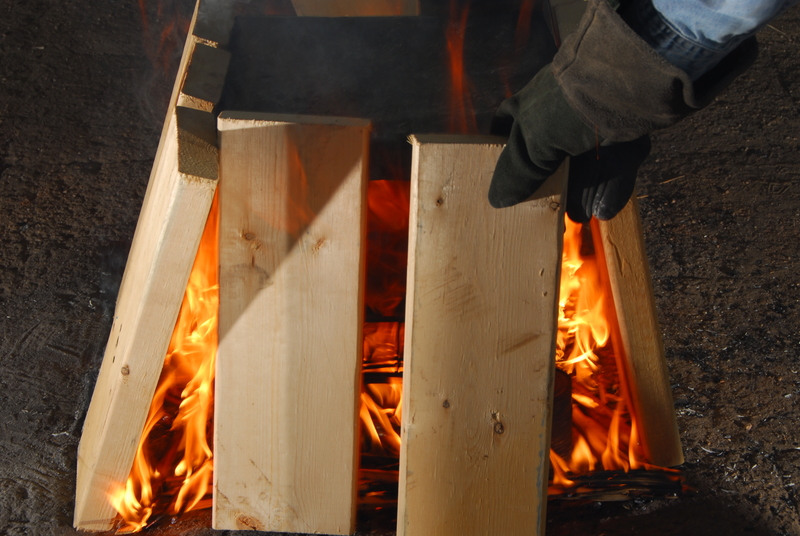 The process is to initially fire the piece black, then an area is heated with a blow torch to burn off the black. 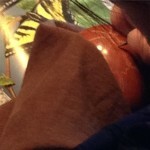 The result is an area which is now sienna in coloration. 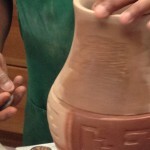 Click here to watch Mike and Jennifer Moquino two toning pottery! 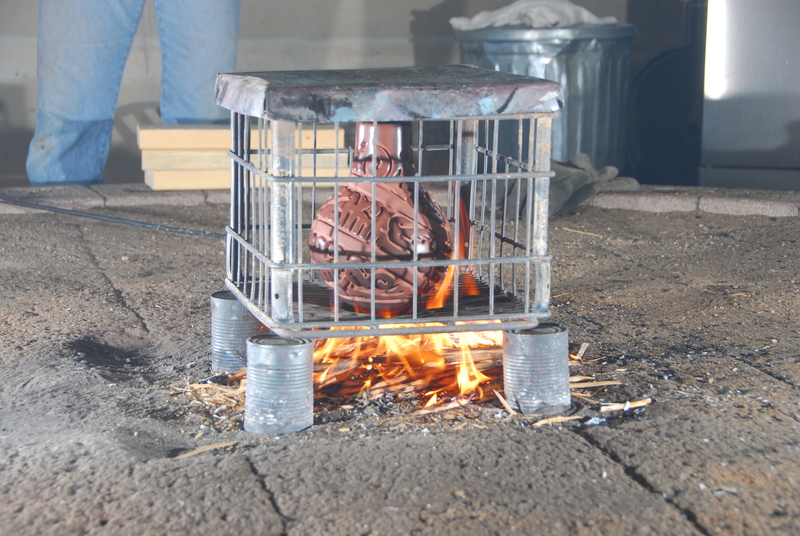 Here are several photos of Helen Naha firing her pottery. 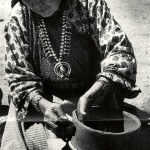 It is placed on pottery shards and she is firing several pieces at the same time. 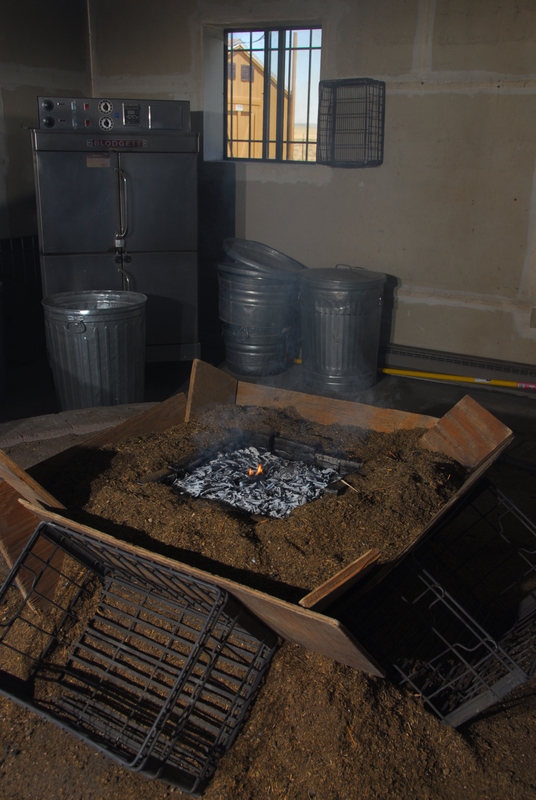 They are surrounded by sheep manure which is stacked in a “honeycomb” style and then lit on fire. When the manure burns out the firing is over. 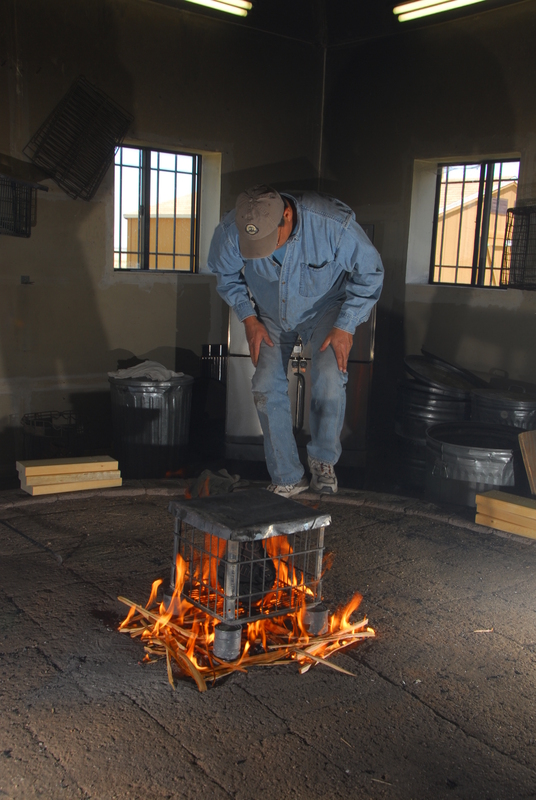 Nathan Youngblood is considers firing the pottery as critical as any other step in the process. 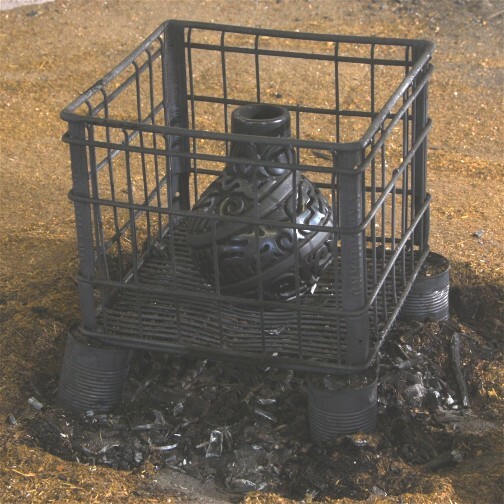 Above it is possible to see how a jar starts out red and placed in a metal crate. 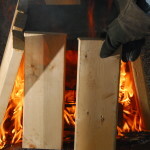 The wood around the piece creates the firing. 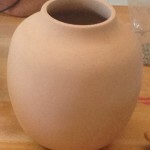 After the firing is complete the jar could be taken out and it would be red. 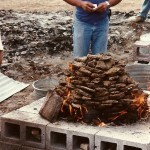 Otherwise, Nathan smothers the fire with manure and this reduction process turns the piece black.